Great week at Vacation Bible School at Second Baptist Church! 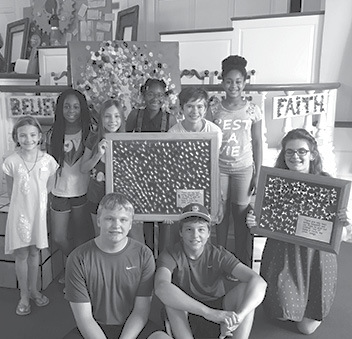 Lee LaRochelle, Emily Fabrizi and Rosie LaRochelle were leaders for the art station, and Zachary Wosko, Ben Wosko and their group shared the week’s projects. Pictured are, clockwise from middle right: Emily, Ben, Zach, Katie O’Hara, Lauren Lawson, Olivia Damboise, Alyson Boateng, Rosie, and Lourdes Lawson. Leader Lee was not present for the photo. All the churches in town participated, making this a great week. They are excited about next year’s theme of “Gearing Up For God”!